Home / Editor's Choice, Entertainment News, Forum and discussion, Gossip and Drama, Other Political News, Politics / Love struck ANN WAIGURU gushes over her new lover KAMOTHO NGOTHO, this man has the key to her heart. Love struck ANN WAIGURU gushes over her new lover KAMOTHO NGOTHO, this man has the key to her heart. Saturday, February 23, 2019-Kirinyaga Governor, Ann Waiguru, has praised her new lover, Kamotho Ngotho, a city based lawyer, claiming he is an exceptional man. 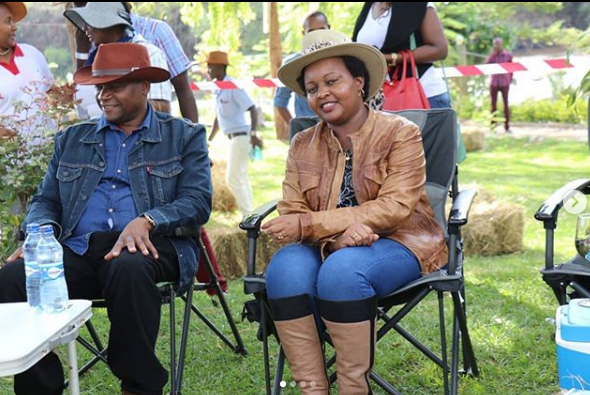 Waiguru met Kamotho ten years ago and they decided to take their relationship to another level through a secret ruracio held in Kirinyaga last weekend. The beautiful Governor says her new found flame is a supportive man who has deep faith in God. She claims when she was facing corruption scandals at NYS , Kamotho was there to support her. “He is an exceptional man. There is no other like him. He was my pillar at the time and has always been. Kind, patient, supportive and level headed,” she says. Waiguru revealed that the city lawyer proposed to her this year at the lavish Lord Eroll hotel in Runda, Nairobi and this caught her by surprise. “I was completely surprised. We had not been talking about formalising our relationship so I did not expect it. We had just come from holidays and we were celebrating his birthday as we do with close friends every year,” Waiguru says. The two have revealed that they are planning to hold a formal wedding after the ruracio that was held last weekend. Waiguru and Kamotho were both married before going separate ways with their spouses.